The "splash page" image I posted up-thread is a composite. This is REALLY interesting to see good "fumetti"! The power of good comics layout is astonishingly clear when it's done right. The power of good comics layout is astonishingly clear when it's done right. That's what makes this so cool! 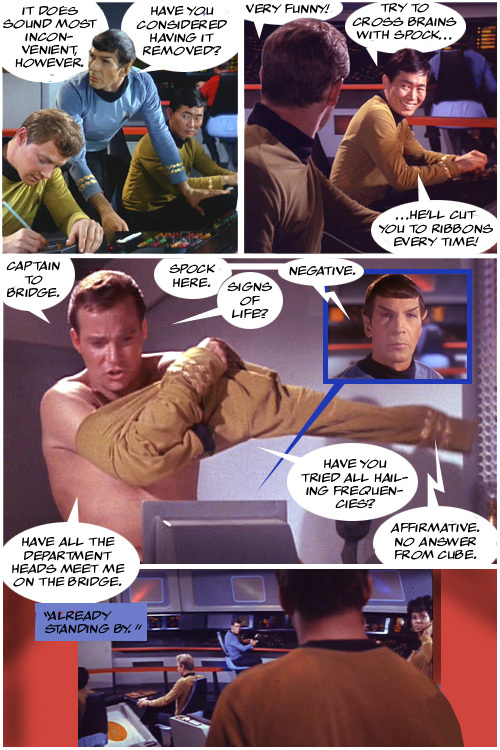 When reading JB's TREK comics, I make a conscious effort to imagine them in the style of TOS--actors' voices, sound effects, etc. This is kinda weird, because now I'm doing the opposite--reading TOS as if it were a comic! For fun, I occasionally imagine what theoretical comic adaptations of various favorite movies and TV shows would be like. This little project is really hitting that button! do you have a feel for how many pages this will end up being? Just wondering if an episode laid out like this would be roughly comic book length (25-ish pages), or mini-series (125-ish pages). These pages are a total blast to read. This is SO much fun!! Who knew "fotonovels" could look so...dynamic? Not a clue! I suppose I could watch the episode, and clock how many minutes in I am at this point, but that would only be a rough estimate, since the length of a scene on film isn't a really certain indicator of how many panels/pages it would take to adapt into this format. Coincidentally, I was thinking about this yesterday, wondering if I should finish this exercise just to give myself and idea of how many pages my "lost episode" would need to be. Eric S: "This is SO much fun!! Who know "fotonovels" could loo(k) so...dynamic?" I agree -- those fotonovels are dead on the the page. These pages have a lot more energy. I love seeing a "Byrne layout" done with stills from the show. Yep, it looks much, much cooler than the old "fotonovels." -- And NO rectangular word balloons! Yes! I'm not crazy about these perfectly elliptical balloons either, truth to tell, but I'm somewhat limited in that respect. The rectangular balloon in the Photonovels made them read like pages from MAD -- not a bad thing in context, but this was not the context! Speaking of the balloons, I was looking at these pages on my iPhone last night. I noticed that they need to be slightly smaller to be a perfect fit on the screen, but I also found myself wondering if I could safely reduce the font size. I made it large for easy reading on a monitor screen, but what does the Forum think? Could I shrink a couple of points and still be legible? Yes, I think that if the font was a tad smaller, it would still be legible. I agree. I think shrinking the font would work great. Here's another little experiment. 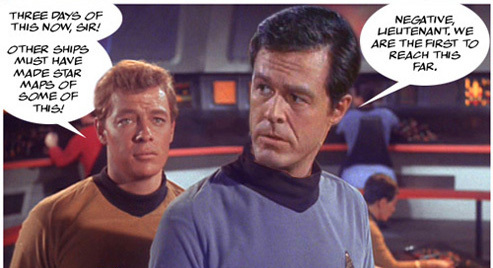 Again, my obsession with Robert Culp appearing on STAR TREK. To the many eyes of the Forum, how does this bit of manipulation work, visually? Think I could successfully make Culp a "guest star" in my "lost episode"? Looks pretty good to me. I think you could pull it off! …but would someone like Culp just jump off the page? The Culp panel you posted is certainly good enough for my eye. The way you're breaking these scenes down into panels is engaging enough that a little Photoshoppery shouldn't be all that noticeable to the reader. 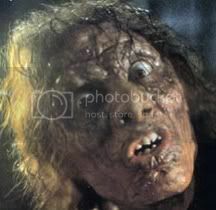 I think the Robert Culp picture looks fine. I bet that most people who looked at it (and was not overly familiar with the show) would not realize it was a Photoshop job. 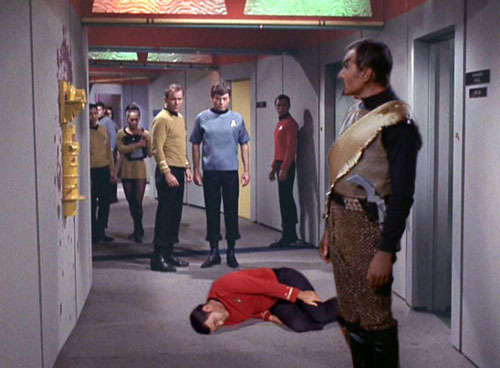 Maybe Jack Lord will finally get his chance to captain a starship now. I did searches on Google and in the Forum, but can't find much. I'll bite...what is the Robert Culp/Star Trek connection/non-connection (other than he was married to a woman that was in one episode)? Culp was a favorite guest star in the Sixties. Seems like he was on an episode or six of most of my regular shows. Yet, somehow, he wasn't on STAR TREK. Probably a million reasons why, but I'd have liked to see it. I for one would love a classic Star Trek episode written by you, JB, so adding guest stars such as Culp would make these even more original than just rewriting with "found footage." The colours really were so saturated. For some reason the static image makes me notice it more. Cull was a favorite guest star in the Sixties. Seems like he was on an episode or six of most of my regular shows. Yet, somehow, he wasn't on STAR TREK. Probably a million reasons why, but I'd have liked to see it. I know this is momentary thread drift, but I hope it's okay if I tell my Robert Culp story. I met Culp briefly at the New York Comic Con a year or two before he died. I told him I enjoyed his work and then asked him a question. My wife and I had been watching COLUMBO on DVD and I wondered how Culp had managed to appear in 4 episodes of the series, tied with Patrick McGoohan. Culp told me that he and Falk had been friends for decades, and we talked about what an amazing actor Falk was. Culp told me how he and Falk had known each other as young actors, and then puffed his chest out dramatically as his voice deepened and said, "Back then, nobody had heard of Peter Falk...and I was the big star!" He then burst out laughing. It saddens me to realize that both Culp and Falk are gone since then.